Build Enterprise Mobile Apps. Faster. At Magnet, our mission is to help the enterprise move to mobile. Our enterprise-grade Magnet Mobile Platform empowers companies to deliver powerful and highly engaging mobile productivity apps that take advantage of all the innovative features in the native platforms. Digital transformation is a top business priority and it includes embracing consumer trends around mobility. However, recent stats on the state of mobile app development in the enterprise are dismal. Gartner has also concluded that the enterprise mobile app journey is a complicated one for IT. All too often mobile apps fail before they’re off the ground because companies try to do too much, too quickly. The road to digital transformation – and mobile – is a journey, not a race. Join Tom Ku, VP Enterprise Mobility and hear him share our recommendation around breaking this journey down into digestible, easy to rollout and test steps before achieving ultimate mobile nirvana! With the hype around mobile, businesses are racing to create mobile apps. Yet most apps take a long time to build and then they languish on the shelves due to a lack of adoption and usage. Research has shown that messaging apps are the most popular as they drive immediate user-to-user interactions that result in high app usage. So how can you ensure that your enterprise apps are not only delivered in a timely manner but also achieve the high usage metrics? Join Renu Upadhyay, Sr. Director Product Marketing at Magnet Systems and Tom Ku, Sr. Vice President, Enterprise Mobility, as they discuss key trends in enterprise mobile app development. Also hear Tom share some real-world customer insights and the 7 steps needed to build a highly interactive enterprise mobile app in just 45 days. 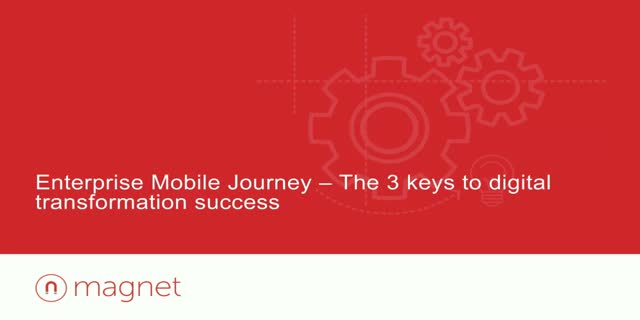 The journey to the mobile enterprise is a challenging one. Employees expect consumer-app-like experiences, business owners want sophisticated apps quickly and IT is dealing with maintaining current infrastructure while tackling other hot priorities such as moving to the cloud and big data. At Magnet, our mission is to help the enterprise move to mobile. Our enterprise-grade Magnet Mobile Platform empowers companies to build powerful and highly engaging mobile apps that take advantage of all the innovative features in the native OS. Join Tom Ku, VP Enterprise Mobility to learn more about the Magnet Mobile Platform and see how you can build and deploy successful enterprise mobile apps. From Facebook Messenger’s bots to the recent Pokémon Go craze, mobile apps are becoming the vehicles for some of the most disruptive consumer technologies today. Yet, enterprise mobile innovation continues to lag behind. As Gartner reported in June, the average mobile enterprise application development budget is actually shrinking even though demand for mobile apps in the enterprise is actually quite high. Join Alfred Chuang, CEO Magnet Systems, as he shares the five must-haves for implementing successful enterprise mobile apps – quickly and efficiently.